The card game Klaberjass is a fun, trick-taking game played with 2 players. Score points by winning tricks with high value cards. 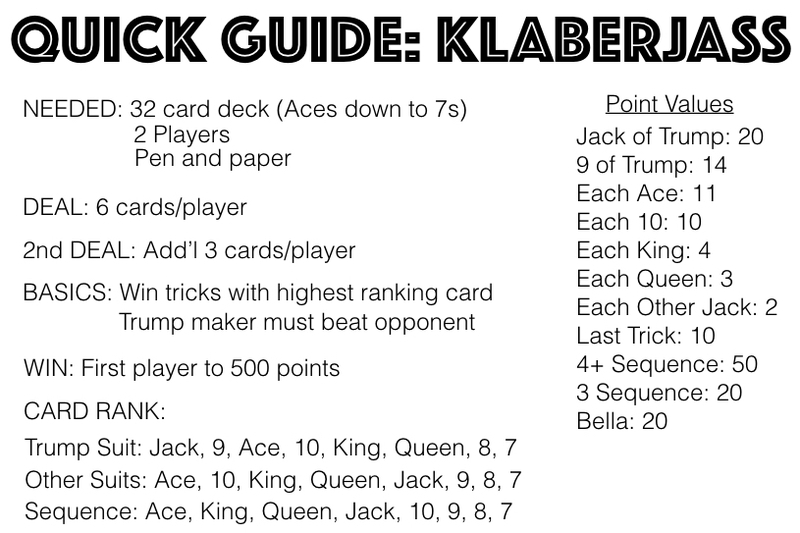 Be sure to keep the Klaberjass quick guide close while playing for a reference to help you learn as you play! Below is the video tutorial and explanation. Deal: 6 cards are dealt to each player in sets of 3 cards. The top card of the remaining deck is flipped up and partially placed under the deck. The suit of the flipped up card is the trump suit for the round. Objective: The object of the game is to be the first player to score 500 points. Points are scored through winning tricks that include cards with point values. Points are also score for having the best sequence, having a bella, and winning the last trick. Game Play: The player that determines the trump suit must score more points than the opponent during the round. The non-dealer has the first option to make the flipped up card suit the trump suit for the round, or the non-dealer can pass which gives the option to the dealer. If both players pass on the flipped up card suit for trump, the option to call any other suit as the trump suit is given to the non-dealer. If the non-dealer passes again, the option moves to the dealer. Once a trump suit is established, the dealer will deal 3 more cards to each player. The bottom card is also flipped up for each player to see. This card has no impact on the game play, it just gives the players an opportunity to know one more card. Before the tricks are played, any player with a sequence of 3 or more cards in the same suit can score points for it. Only the player with the best sequence will score for it. A sequence of 4 or more cards is worth 50 points. A sequence of 3 cards is worth 20 points. The non-dealer is the first to play a card into the middle. A player must follow suit by playing a card in the same suit that was led whenever possible. The player with the higher ranking trump card will win the trick. If no trump cards were played, the player with the higher ranking card in the lead suit will win the trick. The player that wins the trick will lead the next trick. Players continue to play tricks until all cards have been played. The player that wins the last trick is awarded 10 points. At the end of the round, players will count the point cards from the tricks won. If the player that determines trump ties the non-trump maker in points, the determiner does not score any points. If the player that determines the trump suit scores less points than the non-trump maker, the non-trump maker scores his/her points plus the determiners points from the round. A player must follow suit by playing a card in the same suit that was led when possible. If a player cannot follow suit, the player must play a trump card to win the trick if possible. If a player cannot follow suit or trump, any card can be played. If a trump suited card is led, an opponent must beat the trump card played if possible. Only 1 sequence can be scored for during a round. A sequence must be at least 3 cards in a row of the same suit. The sequence with higher ranking cards wins when both players have an equal length sequence. A sequence with more cards in it beats any sequence with less cards in it. If you have the king and queen of the trump suit in your hand, it is known as bella. You can score 20 points by announcing bella as you are playing the second of the two cards into a trick. If you hold the 7 of trumps, you can exchange it for the flipped up card from the deal. This must be done before playing a card into the first trick. If both players pass on making the flipped up card trump, and both pass again to determine any trump suit, the hand is folded and the deal moves to the next player. If both players go over 500 points in same round, the player with the higher overall score wins the game.